Night sweats and hot flashes cure! 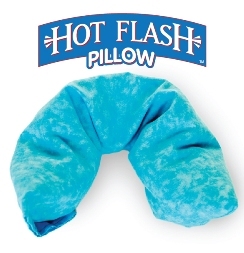 Introducing the Hot Flash Pillow, a soft icing pillow so extraordinarily soothing and effective in cooling your body down it’s likely to become your new “best friend.” The Hot Flash Pillow offers a quick “pick-me-up” anytime a hot flash strikes, and it’s the gentlest answer to cooling down fast and relieving stress. Wondering how to get to sleep? Use this natural sleep aid for relief from insomnia, too. It doesn’t matter what you choose to call it – “Is it hot in here, or is it just me?”, heat exhaustion, power surges, personal summers, night sweats, hot flashes, hot flushes, the change of life, vapors – the bottom line is feeling flushed and overheated is downright claustrophobic and uncomfortable! What is insomnia? The latest insomnia research has proven that being too hot at night makes it difficult for us to fall asleep, let alone stay asleep long enough to feel well-rested in the morning. Simply cooling your head can help you catch more z’s. Why do we become overheated when we’re sleeping? In some cases, fluctuating hormone levels, particularly during perimenopause, menopause, or andropause (male menopause, which causes hot flashes in men), often affect the body’s thermostat, which contributes to hot flashes, night sweats, and/or insomnia . We also can become overheated when we experience undue stress. Millions of people, both men and women, suffer from stress, hot flashes, night sweats, and sleep disturbances for any of myriad reasons. 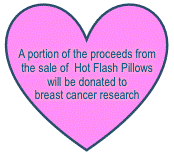 The Hot Flash Pillow helps to relieve insomnia, as well as perimenopause and menopausal symptoms, aches and pains, and more. Improve your quality of life! Can be used while sitting, standing, walking or lying down. Contains an exclusive filler that is dry, odorless, and naturally occurring, and at its coldest feels exquisitely comfortable when applied directly on bare skin. Requires no preparation, just store it in a freezer prior to use. Measures approximately 5″ x 21″ long and folds in half to save freezer space. Has a machine washable attractive outer pillowcase. Easily portable and made to last. If you are one of the millions of people who awaken during the night, as many hot flash sufferers do, nothing compares to the fast refreshing relief you’ll get when you snuggle your neck into the frosty Hot Flash Pillow. 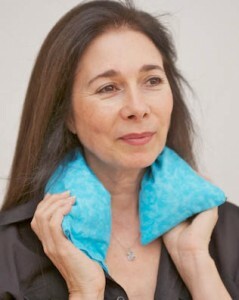 Mold the dry, chilled, soft pillow around the back and sides of your neck and head. Refreshment springs forth the instant you apply the wintry pillow to your skin. Breathe a sigh of relief as your body’s thermostat begins to cool down naturally. Buy two and you’ll always have a cold one on hand!